Crucius Rokha is currently in a competition with Tudax that will probably end up getting both of them killed. With there being some contention about his big kill (a Nurgle Daemon prince which was the target of a Noise Marine ‘concert’) Crucius is aiming to take down some thing big, and undisputable and so now keeps his eyes on the sky. When not on the battlefield he spends a large portion of his free time on the firing range (assuming there is one) or hunting the current planet’s bird analogs. 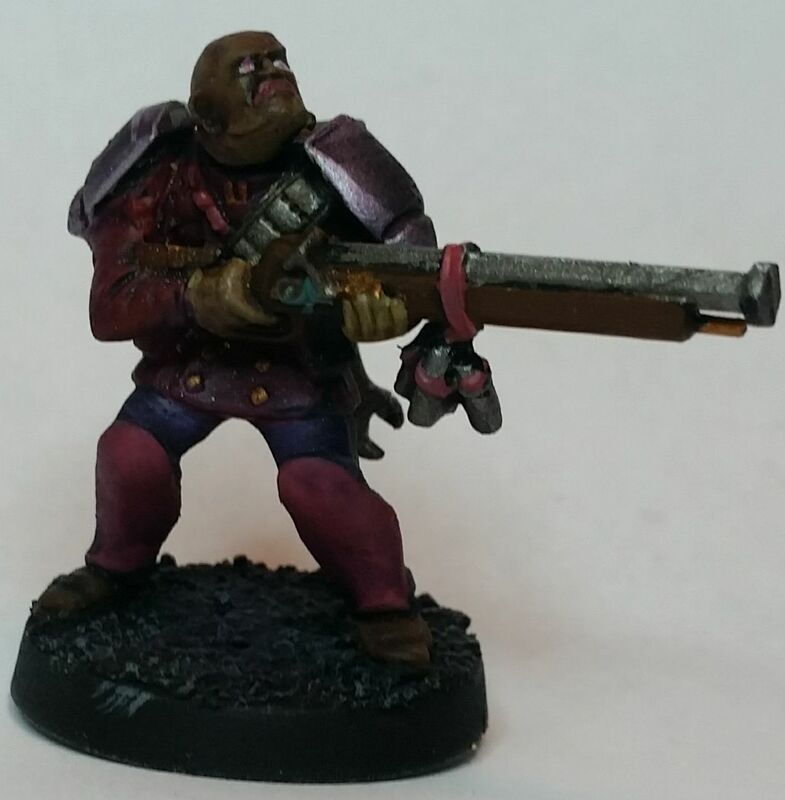 His marksmanship is quite exquisite and if he’d only deign to take a more effective weapon he’d probably earn some sort of boon from Slaanesh, though his perseverance with such a substandard weapon may end up doing the trick if he can ever bring down a big enough enemy. He is also obsessed with fashion, and is the finest hair stylist in the band, however since he can’t abide a less then perfect cut and no one else can seem to do a good enough job to meet his standards he opts to remain bald and clean shaven. This leaves cologne and lipstick as his main fashion accessories; when he can find them on raids he’ll often part with more valuable loot from his share to acquire them. This entry was posted on Friday, October 27th, 2017 at 8:30 am	and is filed under Meet the Cultists. You can follow any responses to this entry through the RSS 2.0 feed. You can leave a response, or trackback from your own site. The barber only shaves those men who do not shave themselves, eh? Quite a dilemma. What are those dangling from the bottom of the rifle? Indeed, not quite the logic puzzle/paradox version and to be honest I’d kind of conflated it with a story I’d heard about a town that had two barbers, but the one with the scruffier looking beard seemed to get the majority of the business. Crucius here just cut out the competition, because as long as you’re going for complete defoliation you don’t really have to see what you’re doing.